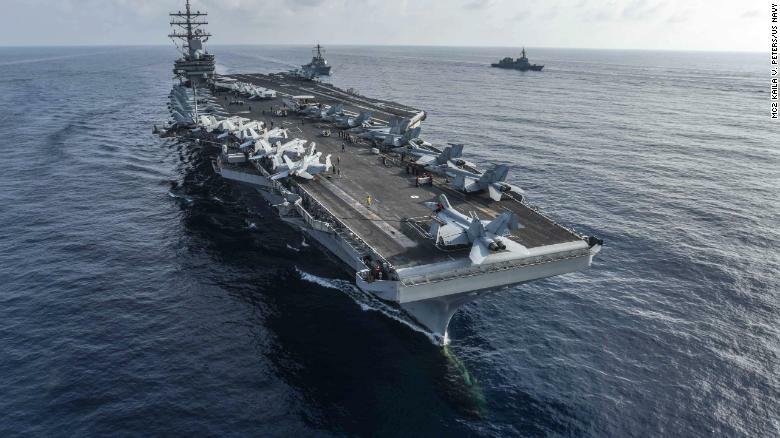 The US Navy’s Pacific Fleet has drawn up a classified proposal to carry out a global show of force as a warning to China and to demonstrate the US is prepared to deter and counter their military actions, according to several US defense officials. The draft proposal from the Navy is recommending the US Pacific Fleet conduct a series of operations during a single week in November. The goal is to carry out a highly focused and concentrated set of exercises involving US warships, combat aircraft and troops to demonstrate that the US can counter potential adversaries quickly on several fronts. The plan suggests sailing ships and flying aircraft near China’s territorial waters in the South China Sea and Taiwan Strait in freedom of navigation operations to demonstrate the right of free passage in international waters. The proposal means US ships and aircraft would operate close to Chinese forces. The defense officials emphasized that there is no intention to engage in combat with the Chinese. While the US military carries out these types of operations throughout the year, the proposal being circulated calls for several missions to take place in just a few days. While one official described it as “just an idea,” it is far enough along that there is a classified operational name attached to the proposal, which is circulating at several levels of the military. Officials would not confirm the name of the potential operation. US officials acknowledge China often see these missions as provocations. They also acknowledge that the intelligence community would have to weigh in with any concerns about reactions from China. The Pentagon refused to acknowledge or comment on the proposal. “As the secretary of defense has said on countless occasions, we don’t comment on future operations of any kind,” said Lt. Col. David Eastburn, a Pentagon spokesman. The US Pacific Fleet also refused to comment. Word of the US Navy’s proposal comes just days after what the Pentagon has called an “unsafe” encounter between US and Chinese destroyers in the South China Sea. The US Navy said the Chinese destroyer Lanzhou came within 45 yards (41 meters) of the USS Decatur while the US ship was on a “freedom of navigation” operation near Chinese-claimed islands. The 8,000-ton destroyers could have been seconds away from colliding, said Carl Schuster, a former US Navy officer who spent 12 years at sea. The destroyer encounter capped weeks of heightened tensions between Beijing and Washington. Late last week, US Secretary of Defense James Mattis pulled out of a planned visit to Beijing later in October, two US officials told CNN. Mattis had originally planned to visit the Chinese capital to meet with senior Chinese officials to discuss security issues. The last-minute cancellation of the unannounced trip has not been publicly confirmed by the Pentagon. Earlier in the week, the Chinese government canceled a port visit to Hong Kong by the USS Wasp, a US Navy amphibious assault ship. Following the cancellation, the US Navy released a series of photos showing troops aboard the 40,000-ton Wasp taking part in a live-fire exercise in the South China Sea. Also last week, the US flew B-52 bombers over the South China Sea and East China Sea. Earlier in September, Washington levied sanctions against the Chinese military over its purchase of weapons from Russia, including Su-35 fighter jets and S-400 surface-to-air missile systems. Meanwhile, on the economic front, the US and Chinese governments have been levying tariffs on an expanding number of each country’s exports. At a press conference last week, US President Donald Trump said his often-mentioned friendship with Chinese leader Xi Jinping may have come to an end. “He may not be a friend of mine anymore. But I think he probably respects me,” Trump said. While the proposal for the week-long exercises is being driven by the US military, carrying it out it during November when US mid-term elections are taking place could have political implications for the Trump administration if the US troops are challenged by China. The proposal for now focuses on a series of operations in the Pacific, near China, but they could stretch as far as the west coast of South America where China is increasing its investments. If the initial proposal is approved, the missions could be expanded to Russian territory. Defense Secretary James Mattis and Gen. Joseph Dunford, chairman of the Joint Chiefs of Staff, will take into account the diplomatic implications of each mission, officials said. They will also have to consider the risk of suddenly moving forces to new areas away from planned deployments, and whether potential threat areas are being left uncovered by the military, especially in the Middle East. At this time the proposal is still being considered within the military. The proposal has grown out of the Pentagon’s National Defense Strategy which focuses on the growing military challenge posed by the Chinese and Russian militaries. Mattis has urged US commanders to come up with innovative and unexpected ways to deploy forces. Currently the aircraft carrier USS Harry S Truman is taking the unexpected step of operating in the North Sea — sending a signal to Russia that US military forces can extend their reach to that area.